Wiring a receptacle (also referred to as an outlet) is another of those fundamental wiring skills that every DIYer should feel comfortable undertaking. The 15A, 125V receptacle is the most widely used device in your home. 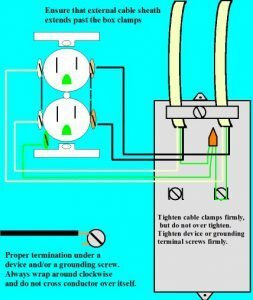 This article and detailed wiring diagram explains the steps to wiring the common household receptacle/outlet. 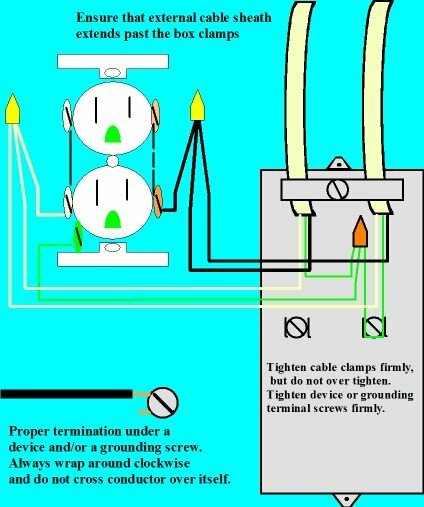 Included at the end of the article is a video demonstration of the proper method of an outlet. This is your standard receptacle that powers everything from your toaster to your TV. Whether you are replacing or adding a receptacle, here’s how to connect them. Always ensure that the power is off before working on any circuit! Make sure that the circuit is properly grounded. When installing or replacing a receptacle, connect the ground wire first. When removing an old receptacle, disconnect the ground wire last. 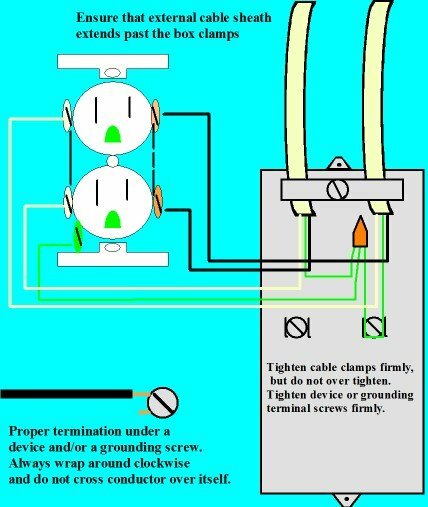 The ground or bonding wire should be connected to the bonding screw in the device box, and either pig-tailed (in the case of more than one conductor), or left long enough to connect to the green grounding / bonding terminal on the receptacle. Connect the neutral wire (s) next. They connect to the silver terminals that correspond with the longer vertical prong on the face of the receptacle. Then connect the black (or red) hot wire (s). They connect to the brass terminals that correspond with the shorter vertical prong on the face of the receptacle. Our sample receptacle has two cables entering the device box, and in this first diagram we are using the device terminals to complete the circuit. Note that this is a practice that is not accepted by everyone, so check with your local electrical authority to determine their position on this. The second method is to connect the receptacle by the use of “pig-tail” splices so that the receptacle is connected to only one set of conductors. In your home, most of the receptacles will have at least two cables entering the same box. The second cable is usually feeding another receptacle, however, it could also be coming from a light or switch. If you have only one cable entering the device box, tighten the unused screws to avoid them coming in contact with the metal box (if using a metal box), or to mitigate the risk of the unused terminals coming in to contact with the bare ground wire when installing the device in place. There are many other types of receptacles that you may find around the house, like 20A, or 15/20A, 125V Receptacles, GFCI (ground fault circuit interrupter) Receptacles, electric Dryer Receptacles (30A, 125/250V), and electric Range Receptacles (50A, 125/250V), to name a few. Here’s a quick video that takes you step-by-step through the wiring of a receptacle. Are there still questions that you need answered about wiring a receptacle/outlet? Feel free to ask your question below or check out my Facebook page and ask there. 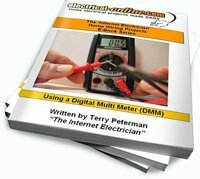 You can also subscribe to my YouTube Channel and check out the many free videos covering a number of different DIY wiring topics, including many instructing you on these types of projects. Do You Have the DIY Skills to Wire That Receptacle? Wiring a receptacle/outlet is something most DIYers are capable of doing. 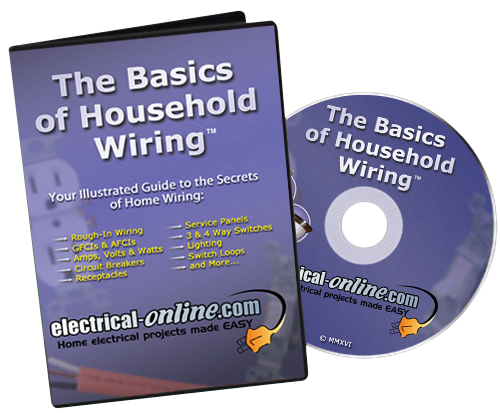 However, if you’re not sure that your understanding of working around electricity and DIY skills have prepared you for wiring that outlet or any other home wiring project, here’s a great resource to bring your skill levels up to speed. 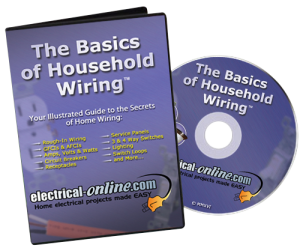 This entry was posted in Indoor Wiring and tagged 125V, 15A, black wire, circuit, conductor, device, diy, diy electrical, DIY wiring, do-it-yourself wiring, home electrical, home electrical wiring, home electrical wiring diagram, hot wire, house wiring, household wiring diagram, how to wire a receptacle, neutral wire, outlet, receptacle, terminals, wiring, wiring a receptacle, wiring diagram. Bookmark the permalink.